This website is based on an account written by G.E.Rabone in 1983 and originally published by Stephen Rabone, under the title "On His Majesty's Service". The text recounts the travel experiences of G.E.Rabone, during his time as a member of the Royal Air Force in Western Europe, in the period immediately before and after the end of the Second World War. 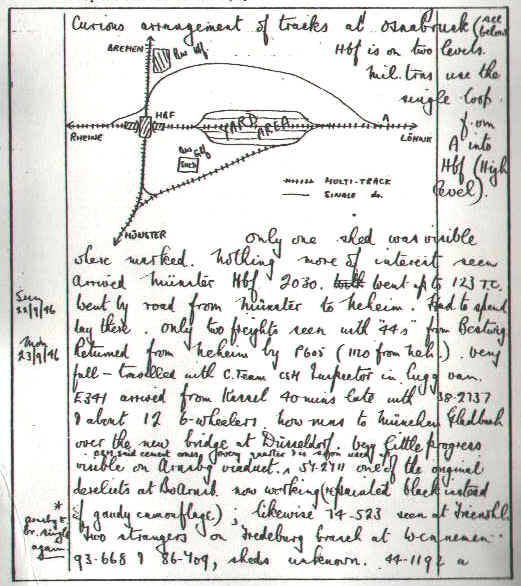 The text draws heavily upon the notes contained in the detailed travel diary which he kept during these years (part of which is reproduced below). It is hoped that readers will find this account a source of much valuable information about this largely forgotten period of railway history. The text is largely unaltered as written in 1983, and therefore contains certain references that are now out-of-date. Some of the photographs on this website are not of the highest quality. We would ask you to remember the conditions under which they were taken, with poor quality equipment and film. Unfortunately there are no photographs available until the period covered by the July to September 1945 pages. Most photographs are presented as "thumbnail" images. Click on the photograph to see a larger image. Use the back button on your browser to return to the page. Railway enthusiasts, now in late middle age, who served in H.M. Forces during the Second World War, must all retain special memories of journeys and railway experiences. The writer was able to keep detailed records of all the locomotives seen during four and a half years with the R.A.F. in the United Kingdom, in North America and in Western Europe. Early in 1943, I remember seeing Great Western Railway No. 2800, banked an Old Oak Common 2-6-2T No. 6100, taking an enormous freight out of the lay-by and up Dainton incline. Later that year I saw a filthy dirty Al class No. 2561 ‘Minoru’ on a King’s Cross to the North train, of twenty coaches, clanking wearily into Retford. I had seen ‘Minoru’ in sparkling green on the last pre-war Grand National Pullman special at Mottram on the Woodhead line in March 1939. In the autumn of 1943, I met the New York Central ‘Hudsons’ and the ugly New York Central electric locos at the changeover station at Harmon, outside New York. Then there were the Canadian National Railroad 4-8-4s passing on the east and westbound ‘Ocean Limited’ at a loop in the forests of eastern Quebec. There were many more of these monsters at the Canadian National repair works which adjoined the R.A.F. camp at Moncton, New Brunswick. Early in 1944, in Ulster, I saw most of the smart 2-6-0s and 4-4-0s of the Northern Counties Committee in Midland Red and even one of the blue compound 4-4-0s, ‘Falcon’, at the Great Northern Railway of Ireland station in Belfast. I think, however, that what I remember most clearly from the whole period in uniform was my first German loco, a streamlined ‘Pacific’ 01.1095, in the drab camouflage livery used by the Reichsbahn towards the end of the War. It lay derelict, but apparently undamaged, on the Frankfurt to Kassel line just north of Marburg, by the road along which our small convoy of radar trucks was passing in April 1945. I had been, for over nine months, one of the crew of a small mobile radar station and, after various journeys and wanderings in the U.K., we went to France in the Summer of 1944, landing at the Mulberry floating harbour. We moved about in northern France, then to the Ardennes district of Belgium and on to a small town near Antwerp in northern Belgium. We crossed into the small isolated piece of the Netherlands called Zeeland Flanders and finally, in the early spring of l945, across to Roermond in Limburg province, where we remained for several weeks. Here we were joined to a larger unit of about forty-five men, to work as their stand-by station. Our own Commanding Officer refused to live in the town, which had been battered by bombing or street-fighting, so we lived in tents on open land outside the town, and about one and a half miles from the German frontier. The radar was all in the town so we had to commute to and fro, day and night, by truck, or on the motor-bike pillion of one of our army dispatch riders. I see from my diary for the latter part of 1944, and until we reached Roermond, that I saw mainly Belgian locomotives, together with quite a few U.S.Army 2-8-0s and W.D.2-8-0s and 2-10-0s. In the docks area at Antwerp, where we went to collect rations in the late autumn, I saw several antique tank engines shunting, No.5152 a 0-6-0PT, No. 5707 a 2-6-2ST and two side tank 0-6-0Ts, Nos. 5811 and 5817. On one of these ‘ration runs’, as we called them, I saw a very English-looking 4-4-0 at Zwyndrecht near Antwerp. Most of the Belgian locos I saw were at Mons in the south, where we had to go regularly. There was very heavy traffic running through this station. Mons is in the Borinage, the rich coalfield district of southern Belgium, and there was much mineral traffic. I noted that many of the American locos were from Aulnoye, a French shed just over the border from Mons. Shortly before we moved to Roermond, I travelled on the Malines-Terneuzen railway, a small private line which then began on the main line from Brussels to Antwerp and ran across country over the Scheldt at Temsche, where we had been throughout the later Autumn and early Winter of 1944, and over the frontier into Zeeland-Flanders. It ended at the port of Terneuzen on the Scheldt estuary. The bridge over the Scheldt at Temsche had been destroyed, either by bombing or perhaps by the Germans when they retreated shortly before. So the Malines-Terneuzen railway ran only from Temsche to Terneuzen. I saw the station at Temsche without realising that trains were running. Shortly after our move over the border to the small Dutch town of Axel, I travelled on the line from there to Ternuezen. The booking clerk at Axel spoke French when he realised I had no Flemish. He gave the fare to Terneuzen return as "deux florins" - two florins, or Dutch guilder. That day, I saw the three M.T.R. locomotives; very British-looking 0-6-0s they were, Nos. 28, 30 and 31. Terneuzen was not very cheerful, full of British sailors, many of them wearing khaki battledress, like me. They would be off mine-sweepers, or something to do with the clearing of the estuary of the big rivers which flow into the North Sea nearby. In April 1945, just after Easter, on April 1st (the R.A.F.’s twenty-seventh birthday) we left Roermond; our small sixteen-man crew now joined more or less permanently to the larger unit with its more powerful radar. I stayed with them for the rest of my service. The last thing I noted before we crossed into Germany was a W.D. 2-8-0 No. 77299, on a train of olive-green U.S.Army four-wheeled vans, passing over a level crossing on the outskirts of the town. This would be the line, now electrified, which runs between Venlo and Maastricht. The road over the border was very bumpy, full of roughly filled shell or mine holes.